Alan Alda, an acclaimed actor, writer and director who has a passion for science and technology, will be the keynote speaker at Carnegie Mellon University’s 118th Commencement at 11 a.m., Sunday, May 17 in Gesling Stadium on the Pittsburgh campus. 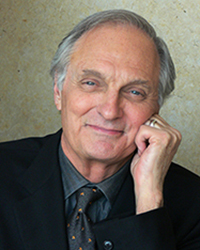 Alda, who exemplifies Carnegie Mellon’s interdisciplinary strengths in the arts and sciences, also will receive an honorary Doctor of Fine Arts degree. As a science enthusiast, Alda hosted “Scientific American Frontiers” on PBS for 11 years, interviewing leading scientists from around the world. He has worked on award-winning PBS programs “The Human Spark,” which explored what makes us human, and “Brains on Trial,” which focused on the implication of contemporary brain science for the U.S. justice system and included an interview with CMU’s renowned neuroscientist Marcel Just. He helped found the Alan Alda Center for Communicating Science at Stony Brook University, where he is a visiting professor, and since 2008, he has worked with physicist Brian Greene on presenting the annual World Science Festival in New York City. He received the 2013 Scientific American Lifetime Achievement Award and was recently elected a fellow of the American Physical Society in recognition of his work in advancing the communication of science. He has the distinction of being nominated for an Oscar, a Tony and an Emmy, and publishing a bestselling book, all in the same year (2005). Kuei is graduating with University Honors with a bachelor’s degree in physics and a minor in professional writing. An active member of the campus community, she was a teaching assistant for physics classes, a mentor for the physics outreach program, a founding member of CMU’s women’s varsity golf team, Science and Technology editor of the student newspaper, and managing editor of the Dossier Literary and Arts Magazine. She will be attending Penn State University in the fall to pursue a Ph.D. in materials science and engineering and to advance her research in energy science. Kai-Fu Lee, a prominent computer scientist, venture capitalist, corporate leader, writer and former CMU faculty member, will receive a Doctor of Business Practice degree. He earned his Ph.D. from CMU in 1988, when he developed Sphinx, the first large-vocabulary, speaker-independent, continuous speech recognition system for his doctoral thesis. Founding president of Google China, he was named one of the most influential people in the world by TIME magazine in 2013. * Pearl is unable to attend commencement due to a family illness. Carnegie Mellon plans to award the degree to Pearl at a future event. Carl Wieman, who shared the 2001 Nobel Prize in Physics, will be awarded a Doctor of Science and Technology degree. While his research continues, his main pursuit in recent years has been on improving undergraduate physics and science education. He is a member of the Global Learning Council, which is chaired by CMU President Subra Suresh. Learn more about the honorary degree recipients. More than 3,000 bachelor’s, master’s and doctoral degrees will be conferred at Carnegie Mellon’s main commencement ceremony. The ceremony will be webcast at http://www.cmu.edu/commencement.